Wim Wenders is a German filmmaker, playwright, author, and photographer who had three Academy Award nominations - Best Documentary Feature: "Buena Vista Social Club", "Pina", and "The Salt of the Earth" (the latter about photographer Sebastião Salgado). Two of his 64 director credits include "Paris, Texas" (1984) and "Wings of Desire" / "Der Himmel über Berlin" (1987). It seems that Wenders regards photography as a thing of the past: "It’s not just the meaning of the image that has changed – the act of looking does not have the same meaning. Now, it’s about showing, sending and maybe remembering. It is no longer essentially about the image. The image for me was always linked to the idea of uniqueness, to a frame and to composition. You produced something that was, in itself, a singular moment. As such, it had a certain sacredness. That whole notion is gone." ... at least for Wim. 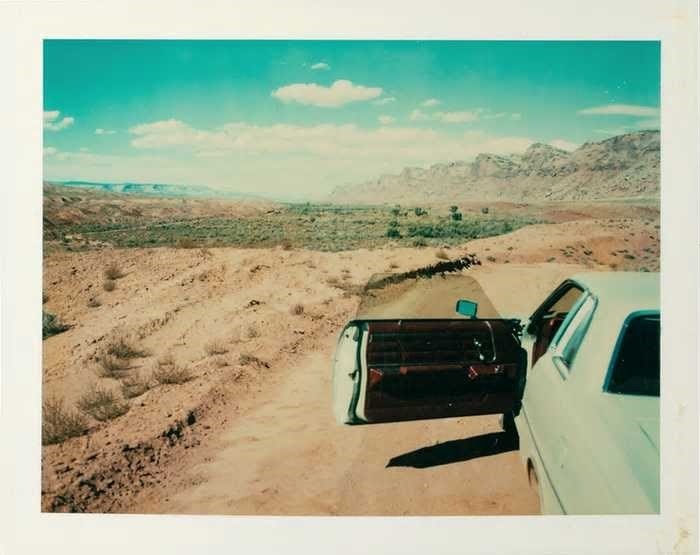 A collection of Wenders's polaroids will be shown as part of "Instant Stories"
at the Photographers' Gallery, London from 20-Oct-2017 to 11-Feb-2018.